As it has done for past events, Apple's upcoming March 9 event, where it is expected to give final details on the upcoming Apple Watch, will be available as a live video stream from the company's website as well as the Apple TV set-top box. The official Apple events page invites visitors to come back on March 9 at 10 a.m. Pacific, 1 p.m. Eastern, when live video from the presentation will be available. Live streaming requires Safari 5.1.10 or later on OS X 10.6.8 or later, or Safari on iOS 6 or later. In addition, the event will also be available on the second- or third-generation Apple TV with software 6.2 or later. The "Spring Forward" slogan Apple is using to advertise its event refers to the start of Daylight Saving Time, which begins a day prior on Sunday, March 8, when clocks will move forward one hour. Apple made the March 9 event official earlier Thursday when the company sent out invitations to members of the media. It's expected that the focus of the event will be the forthcoming Apple Watch, which is set to become available sometime in April. Other products that could be unveiled at the event include a new MacBook Air with Retina display, updates to the existing MacBook Air design, and more. This is the first time Apple has held a media event before June's Worldwide Developers Conference since the announcement of the third-generation iPad in 2012. 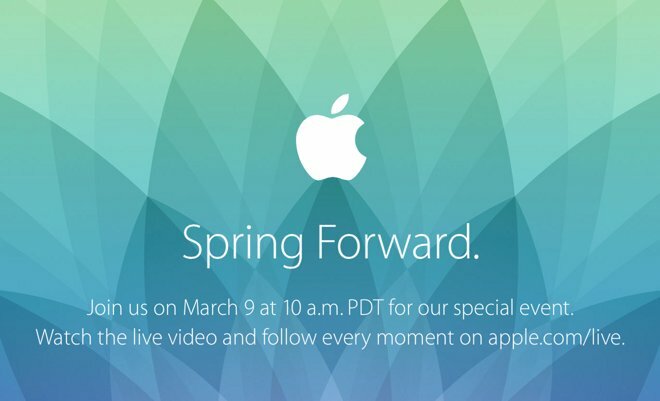 AppleInsider will also have full, live coverage of Apple's March 9 event, and all of the news leading up to it. Readers can stay informed through the official AppleInsider app for iOS, as well as on Facebook, Twitter, and RSS.